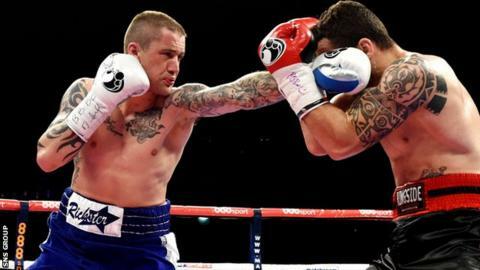 Former world champion Ricky Burns believes he can get his career back on track with a win against the undefeated Omar Figueroa in Texas on Saturday. The 32-year-old Scot lost his WBO lightweight title to Terence Crawford in March 2014, and has lost and won in two low-key bouts since. "I had a tough year but that's all in the past and now it's about moving forward," Burns told BBC Scotland. "If I get the win, there are some big possibilities out there." Burns is facing Texas-based former WBC lightweight champion Figueroa at super lightweight, although he intends to move down a weight class thereafter. "He's a good fighter and this is his home town, so it will be tough but we wouldn't have taken the fight if we weren't confident of getting the win," added Burns ahead of the contest in Hidalgo. "He likes to set a high work-rate, come forward, be aggressive. "But he does tend to take a lot of shots, so that's something I'll look to take advantage of. "The training and preparation has gone well and I can't wait to get in the ring now. We've been working on some different tactics, so I'll take it one round at a time." Burns' first fight in America will be broadcast live on US terrestrial television and the Scot, who was undefeated in seven years at two weights before his loss to Crawford, aims to impress. "I hope the American fans take me for who I am; just a quiet guy who wants to get on with his job," he added. "This is a fight the fans will really enjoy. Omar is popular because of his style and I'm not one for backing away."